Most of the people prefer living in gated communities because of the security features offered by these communities. One most common security aspect available is the authentication of visitors via intercom before letting them inside the community. If you have ever lived in a gated community, the chance that you have allowed people through the gates of your society, by validating their identity through an intercom would be high. The intercom system also referred to as PBX (Private branch exchange) is typically installed by the builder and / or later fixed or installed by the community. There are certain aspects of the system that a community should be aware of before installing. However, before we dive into the details, let’s talk about the different intercom systems a gated community or builder typically considers. In most cases a PBX, IP PBX or a Centrex system is deployed for intercom. Understanding PBX and IP PBX? Private Branch Exchange (PBX) is an internal telephone network that is generally used within a private community, like within a business organisation or within a gated community. In the context of a gated community, residents use the facility to interact with fellow residents, facility offices, security guards etc and they can make unlimited free calls within the community. IP PBX is an advanced version of PBX. The most significant feature added to this version is the addition of VoIP (Voice over Internet Protocol). With this, in addition to free internal calls, the community can also route external calls over the internet, which is cheaper than a regular call. 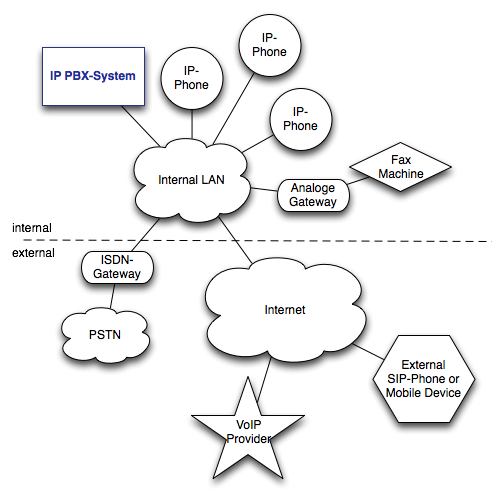 The pictorial example of the working of a PBX system is given in the last section. Centrex is also a type of a PBX. However the switching equipment will be installed at the central office and not at the residents/ customers location. Generally, the telephone agency manages all the equipment and software that is required to implement a Centrex service. Things to consider before deploying a PBX system. Hardware (e.g. exchange system): Rs 50,000/ per piece for about 500 users. 3. If a problem that occurs with the PBX system, the community will be left mediating between the phone service company and the PBX vendor. The community will be left trying to meet ends in order to get the system working again. 4. Any given PBX can support only a set number of phones. Hence removing or adding phones from the existing system will be a huge problem. Also, if the community is expanding by a large number, they might have to add another PBX system, which again is a substantial additional cost. 5. Requires one time Fixed Cost and AMC ( Annual maintenance cost). As time goes by, the AMC cost would keep increasing and after a certain period, would require complete replacement. 6. There would be no particular way to figure out if the line connected to the resident’s phone line is dead or is not responding. 7. ‘Moral Hazard Issue’, a situation where the resident may not take care of the device since it is not his/hers, might be a point of concern. This would increase the AMC cost to management committee. How are intercoms/ PBX systems used in gated communities? Every house in the community has an intercom device at their home and one at the entry and exit gates of the society. There is a specific code allotted to every intercom, which would be used to call the specific device. The call is routed through an internal exchange. All these intercoms are interconnected to increase the connectivity, communication and security in the apartment. Whenever a visitor enters the gate of the community, he/she tells the guard the house number they want to visit and the guard dials the code of the intercom in that specific house. The guard then validates the visitor’s identity by asking the resident if he/she is expecting the visitor and based on the resident’s response the visitor is either let into the community or told to leave. 1. In case the resident is not at home or is unable to take the intercom call due to some situation, the visitor’s entry or exit into the community is left for the guard to decide. 2. There is no equipment portability with wired intercoms, since the device needs to be plugged in. Hence the resident would need to leave whatever they would be doing at that moment and got to the intercom to attend the call. 3. In case the wire is disrupted, due to stormy weather, electrical problems or utility power-cut, the device becomes invalid and the sole reason of installing an intercom fails. 4. Being an electronic device, the lifetime of the intercom device would be around 3–4 years. Hence replacing the device is a recurring cost that has to be borne by the community apart from the initial hardware and the installation costs. 5. The resident does not have the option of choosing the calls they want to take or avoid. CPU: Like computers, a PBX device too has a CPU ( Central Processing unit). It controls all switching activities, call logging, connect, routing of calls, disconnect etc. Power Supply: A power supply of -48V/-24DC DC is required for the telephone instrument to supply a dial tone, ring tone etc. The capacity of the unit depends on number of extension lines of the PBX. It is generally designed with a plugin card built into the PBX cabinet. Line Cards: These are used in order to increase the number of extension lines. This hardware equipment provides connects the telephone instrument at the user end. Operator console: Is used to control incoming calls and routing incoming calls to extensions with the help of human intervention. Trunk Lines: They are Analog or digital connections to the outside world of the PBX. Handsets: This is the device that will be placed in every house of the gated community and at every important check post of the community. Exchange: A large switching station that connects and routes calls. It could be internally or externally. To know about how myGate is tackling each of these problems at a much easier and a simpler level, Click Here.